Ange Postecoglou communicated his decision to quit as Socceroos coach in November, although Australia should qualify for the 2018 World Cup. It is understood that Postecoglou wants to return to the daily-basis involvement at club level, maybe on Chinese Super League or elsewhere. His tactics and line up decisions have been highly scrutinised during Postecoglou’s more than four years as Australia’s head coach. So, near to the end of Postecoglou’s tenure with the Socceroos – and with a play-off game against Honduras to reach the World Cup finals still ahead – is time to take stock of the coach’s work with the Oceanian side. Since the start back in June 2015, Australia’s qualification trip has been laborious at the best, leaving a mix of good and bad into Socceroos fans’ mouth. Australia needed an 118th-minute Tim Cahill header to defeat Syria and advance to the final games of their troubled World Cup qualifying campaign. Media harshly criticized Postecoglou’s inability to lead Australia directly to the next World Cup, but they forget that Socceroos have been handed a tough draw in the final group stage of the Asian qualification as they landed the rival Japan, an improved Saudi Arabia and a difficult side to challenge in UAE. Above all, despite these critics, Australians are still in the race to gain their World Cup berth whilst other teams such as Holland, Chile – two times South America’s champions – and USA – after qualifying for every World Cup tournaments since 1990 – are already out. Postecoglu is a coach faithful to an offensive and proactive play style featuring a lot of combinations, search for the depth and high pressure. Since Australia’s game against Iraq, Postecoglou left the 4-2-3-1 shape and switched his team to a 3-2-4-1 formation trying to mould Socceroos into a modern attacking team. However, trying to adapt his thoughts to the footballers at his disposal, Postecoglou’s approach has been more conservative and cautious than expected by fans and media. In fact, Australia’s midfield repeatedly looked defensively shaped, with two holding midfielders covering the back to the more advanced players. That has been evident during the two games against Syrians. In the first leg, Postecoglou lined up Aaron Mooy and Mark Milligan as holding midfielders with the primarily task to stay as close as possible to the back three. Postecoglou wanted to protect a back line which has been harassed by opponents during the qualifying campaign also providing it with a couple of close safe valves in the way to get the ball progress through in the buildup. That’s an area where Socceroos particularly struggled as Postecoglou’s men had troubles to get the ball clean out from the back as the centre-backs lack of the needed qualities to move the ball with Australia in possession. So, putting a couple of midfielders close to the backline, Postecoglou thought to get Australian buildup more fluid. When it worked, and when Australia could progress the ball, Mooy and Milligan had the goal to play the ball out wide to the wing-backs or directly up front. Unfortunately, in the first leg against Syria things didn’t ever worked according to Postecoglou’s game plan. In fact, the no.10s have been forced to drop back sitting in front of the Syrian midfield in order to get some playable balls. By moving there, they prevent Australia from gain positional advantage up front, reducing their chances to create goal scoring opportunities. The whole buildup became slower and unable to manipulate Syria’s defensive structure. Maybe Postecoglou suffered the criticism for his offensive attitude, so he implemented a more cautious approach that amassed players on his own half, reducing the risk to be counter-attacked. He stayed faithful to his 3-2-4-1 but put more emphasis on the defensive side of the game. Postecoglou partially left this defensive approach by reverting to a more attacking side in the second leg, where he lined up a lone holding midfielder in Milligan. The rest of the midfield has been more offensive with James Troisi, Robbie Kruse and Tom Rogić constantly roaming up front. Some pundits defined Postecoglou’s midfield as a 1-3 shape. Mooy’s relegation to the bench raised some eyebrows among fans after his performances in the EPL this campaign. By the way, after Brad Smith went off due to an injury in the 11th minute, Postecoglou inserted the Huddersfield Town midfielder but, instead of reshaping the midfield, switched Kruse to the left flank in the advanced trio, keeping an offensive formation with Kruse, Troisi and Rogić supporting Tim Cahill. 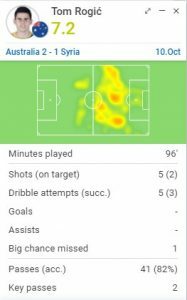 Although Cahill’s presence obviously influenced Australia’s game plan – as they put a lot of crosses (41) into the penalty box – Socceroos’ play looked more fluid than usual, with Postecoglou’s side that dominated possession (76%) and produced a total of 25 shots (11 on target). Matthew Leckie was particularly efficient on the crossing game with a good percentage of successful crosses (4/7). The stats from the second leg. Rogić too benefited from the tactical reshaping as he produced one of his best performances for Australia, playing 41 passes (82% accuracy) with two key passes and 5/6 accurate long balls. Surely, he missed a couple of good opportunities in the second half that could have avoided the extra times but the Celtic player still put his mark on the game. Rogić’s stats in the second leg against Syria. That said, Australia was unable to get Cahill involved as the centre-forward received just 12 balls during the game. The job isn’t done yet as the Socceroos didn’t get yet their pass to the World Cup. That said, they embraced Postecoglou’s style. If the coach fuelled a more offensive approach into Australian football remains to be seen and some questions still remain to be answered. Surely, Postecoglou put the basis for the next manager to build something for the long term. First and foremost, the next man in charge will have to find the way to get Socceroos’ best player – Cahill – more involved in the offensive phase. The 37- years old Cahill is aged but he hit 50 goals for Australia and still remains the best forward at Australia’s disposal. But who are the potential replacements to replace the departing Postecoglou? An interim solution should be crossed out with the next Asian Cup starting in UAE just six months after the World Cup. Kevin Muscat and Graham Arnold look to be strong candidates but FFA could also consider an overseas coach. In this case, Josep Gombau could be the name with former Adelaide United’s boss having the same offensive craving than Postecoglou.